Auto, Car, and Motor Vehicle Accident Lawyers in Westchester Working to Protect the Rights of Accident Victims. If you or a loved one has been involved in an auto accident in Westchester, Florida, it is important to find experienced personal injury attorneys who will protect your legal interests during this difficult time. At Gerson & Schwartz, PA our Westchester car accident attorneys have the skill and experience you need. If you were injured in a car crash in Westchester, or you just live in the area, call us today to learn about how we can help you. Our Miami personal injury law officers are located near Westchester and we routinely assist car accident and serious personal injury victims in the area. We are dedicated to ensuring every victim and client receives the full and fall value of his or her claim. Westchester, Florida is a “census designated place” (CDP) within Miami-Dade County. Though it is not incorporated as a legal entity, Westchester is nonetheless home to nearly thirty thousand residents. Like any populated area, Westchester experiences auto accidents, and the victims of these accidents are entitled to be compensated for their injuries. For this reason, anyone hurt in a car crash in the area should speak to a car accident lawyer in Westchester as soon as possible. Who Can be an Auto Accident Victim? Bicyclists injured by the negligent driver. Any bystander who sustained injuries as a result of the accident. Use extra caution in construction zones. Large trucks and equipment can make it difficult to see hazards and obstructions in the roadway. Give large trucks extra space. Construction vehicles, eighteen wheelers, semi trucks and other big rigs require greater stopping distance. Signal your movements well in advance to give larger vehicles adequate response time. Tire blowouts. Hotter weather leads to more blowouts, which can cause other drivers to respond unpredictably. Always lead adequate stopping distance between your vehicle and other vehicles on the road. Road rage. Hotter temperatures also cause hotter tempers. Resist the temptation to speed, tailgate, weave, or flip off other drivers. Tired driving. Make sure to pull over if you start to feel sleepy during extended driving periods. Never drink and drive! Not only is it highly dangerous for everyone on and near the roadway, but it can result in serious consequences that affect the rest of your life. Criminal records, decreased employability, court costs, community service, and suspension of your driver’s license are among the more pleasant possible outcomes of a DUI conviction. Watch your speed. The best way to avoid a collision is to allow yourself enough stopping distance to safely respond to obstacles in the road. Exercise particular caution at night, in inclement weather, and any other time visibility is decreased. Small vehicles and motorcycles are harder for other drivers to see, making it difficult for other vehicles to avoid collisions. Don’t allow yourself to be distracted by technology. Texting, navigation systems, entertainment systems, tablets and smart phones all pose serious safety risks for the driver who focuses on them. Regularly inspect your vehicle. A simple check for debris, leaking fluid, and broken lights can avoid serious problems on the road. 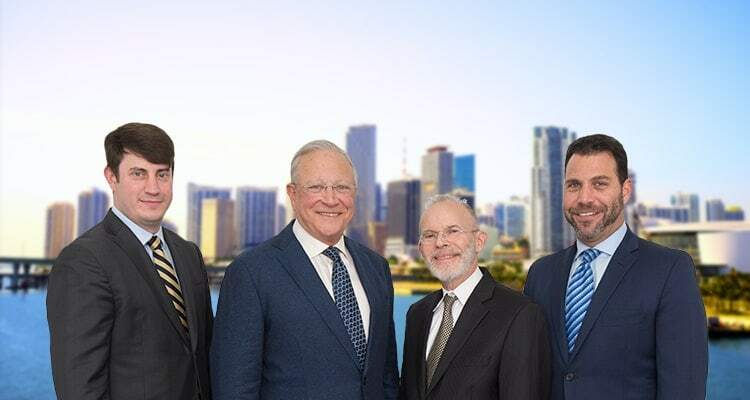 The Miami accident and personal injury lawyers of Gerson & Schwartz, P.A. have over 46 years of experience protecting the rights of auto accident victims in and around the greater Westchester, and Miami area. We will protect your right to recovery after any kind of accident. Our friendly, professional staff offers the personalized service needed to get you the compensation you deserve. Call our office today at (305) 371-6000 or speak to a lawyer today by calling us toll free (877) 475-2905 to schedule your free consultation with a Westchester car crash lawyer. You can also email us through our online contact form.